From July 8th to the 11th, the 13th China (Guangzhou) International Building Decoration Fair was held in Guangzhou Zhangzhou Exhibition Hall. 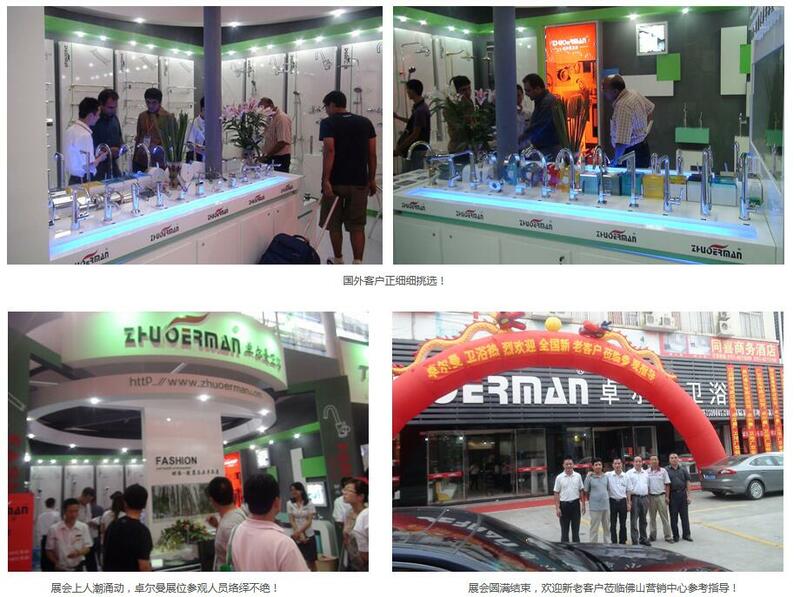 Zhuoerman Sanitary Ware Co., Ltd. of Foshan City participated in this grand event for the first time with its faucets, ceramic sanitary ware, and metal pendants, and achieved fruitful results. Zhuo Zhuoerman Sanitary Ware Co., Ltd. of Foshan City has been following the international trend since its establishment and has become an integrated enterprise specialized in the research and development and sales of sanitary ware products. Products include: bathroom cabinets, wash basins, hardware faucets, toilets, shower rooms, steam rooms, jacuzzis and more than a dozen varieties. The product passed the ISO9001:2008 international quality management system certification, and the product was underwritten by Pacific Insurance Company. Incorporating modern aesthetic concepts and designing sanitary ware products that meet the tastes of modern people. Zhuoerman bathroom sales network throughout Russia, India, Vietnam, Southeast Asia and Africa and other countries. At present, Zhuoerman sanitary ware focuses on the development of the domestic market, establishes a sound domestic sales network, and strives to build Zallman Sanitary Ware into a domestic first-class well-known sanitary enterprise. According to Lin Wei, general manager of Foshan Zhuoerman Sanitary Ware Company, Zhuoerman Sanitaryware participated in the exhibition with three new products. The main faucets are distinguished series, fashion series, and dynamic series. Their energy-saving and environmental protection characteristics are loved by consumers. Metal pendants are mainly based on the space aluminum and bronze series. The ceramic sanitary ware adopts the super swirling two-hole flushing technology. Two holes are flushed at the same time. It will instantly produce a powerful double-helical turn flow, which will bring plenty of flushing power and allow the dirt to hide. This new technology has attracted the attention of consumers. In the past four days, Zallmann successfully signed more than 20 distributors in the sanitary ware field, with dozens of customers in mind, and hundreds of thousands of dollars in export orders. This has yielded fruitful results. Thanks for the support of new and old customers! Zallmann will always provide you with satisfactory products and services!